In 2013, Wellesley was named one of the 41 Scenic College Campuses That Were Made for Instagram on Buzzfeed. And it’s true, the College has grand historical and award-winning modern architecture integrated into a stunning landscape, which lends itself to gorgeous Instagrams. What's more, its community of diverse and creative people is always up to something interesting—and often photogenic. The generation of prospective students now in high school or even younger are intense Instagram users. As Wellesley’s Ryan Ackell ’17 tells it, “Teenagers are always on Instagram scrolling through their dash.” This makes it an especially effective way to get in touch with those young women frequently but without brochures or long messages. “Prospective students following Wellesley can have reminders each week about how amazing and beautiful Wellesley is,” points out Ackell, a social media assistant in Wellesley's public affairs office. Beyond intriguing potential future students with the College's beauty and activity, Instagram provides a place for current students to post and like photos of the College. Alumnae too may find a quick trip down memory lane on Instagram, and can post their own new or nostalgic Wellesley photos. A sneak peek at a real Wellesley College dorm room. A quintessential college shot of Tower Complex on a sunny fall day. Beautiful in every season, Wellesley had quite a winter. An example of Wellesley students' passion for volunteering. Wellesley's Instagram account will be posting pictures of everyday life, Wellesley traditions, and gorgeous spots around campus. Occasionally we will throw it back using photos from the College’s archives, or highlight a student shot during a photo of the week contest. 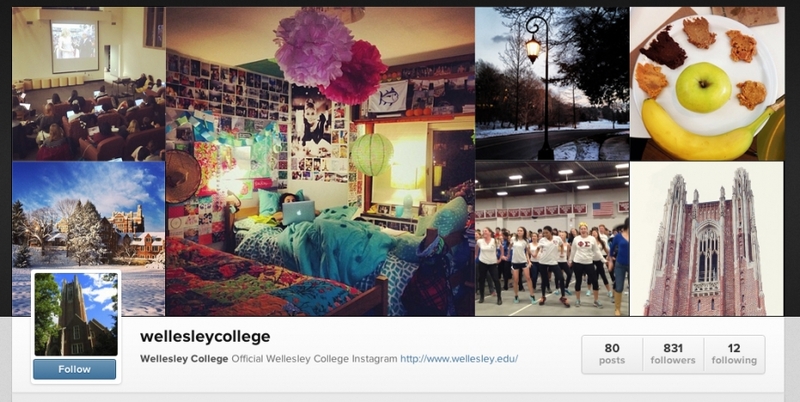 Please follow Wellesley on Instagram! If you post a photo and you want us to see it, tag the photo with #WellesleyCollege. Photos tagged with #WellesleyCollege may be chosen for our photo of the week! Keep an eye out for other Wellesley related tags as well, such as #ScreamTunnel, #Hooprolling, or #Ruhlman2014.